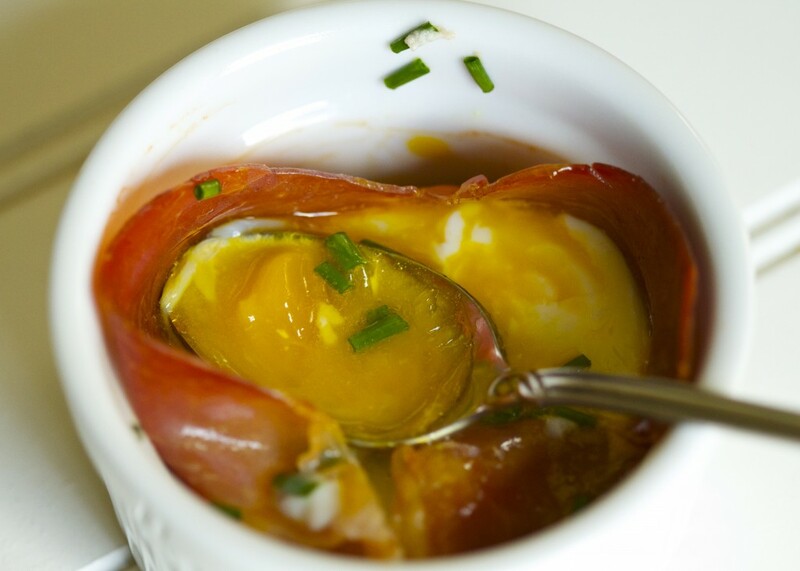 Baked Eggs in Prosciutto Cups is an easy recipe that qualifies, in my humble opinion, as “good enough for company”. Both my boys loves these – even my son who does not especially like to eat eggs. I have made a similar recipe using a muffin tin but find it easier and with better results when using ramekins. 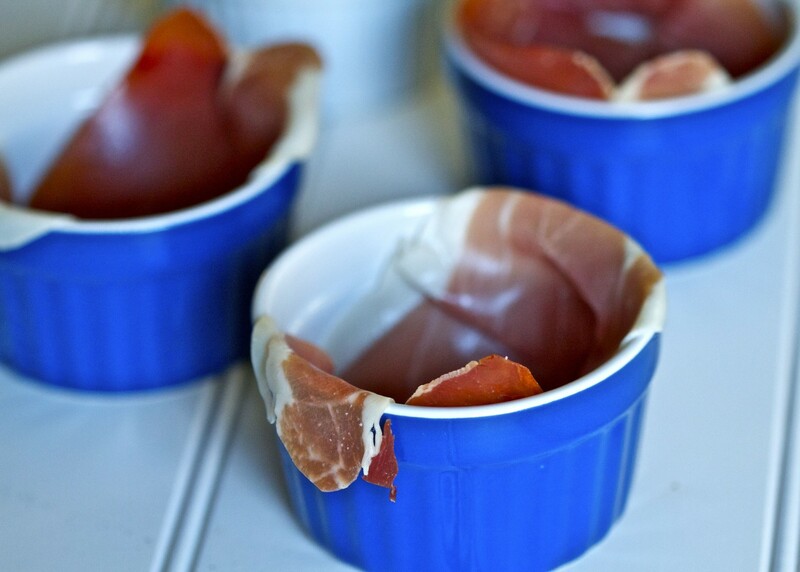 Muffin tins must to be greased in order to keep the prosciutto and eggs from sticking. And they never seemed to come out clean unless I spent a lot of time carefully lining the tin with the prosciutto so the egg could not seep through. With the ramekin it does not matter because you are eating the egg cups right out of the dish. That being said, you can still use a muffin tin for this recipe. Just be sure that you grease the tins well. 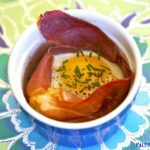 Besides being super easy and delicious, one of my favorite things about this recipe is the use of prosciutto. Unlike many other cured pork products, prosciutto does not (normally) contain nitrates/nitrites because it is cured with salt. In fact, salt is generally the only ingredient, besides pork, you will see listed on the label. This is great news for me, and others like me, who have a reaction to nitrates/nitrites and other preservatives. 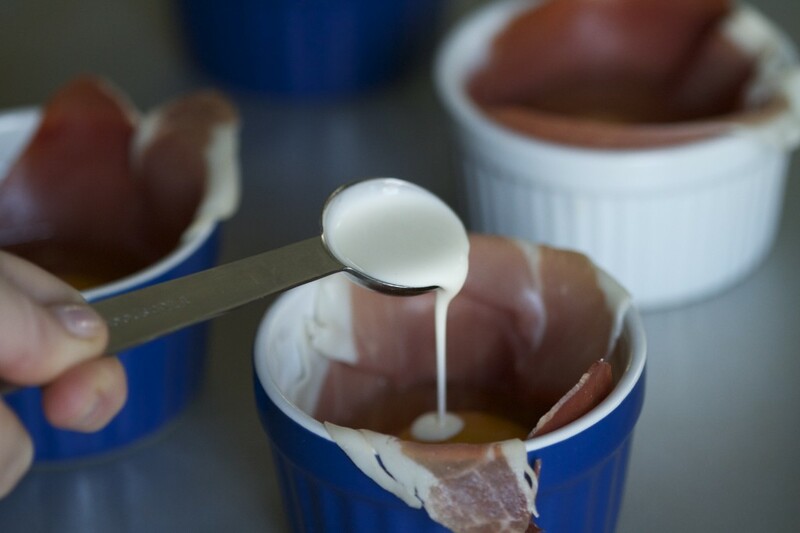 Crack the egg into the prosciutto-lined ramekin. Add a teaspoon of heavy cream (if using). Add a dash of black pepper and a sprinkle of chopped chives. Place ramekin(s) on a baking dish and bake for 15 minutes. Remove from oven and allow to stand for 5 minutes to finish the cooking process. You definitely do not need to add salt to this recipe because of the prosciutto. In fact, I do not recommend using more than one slice of prosciutto per egg because it would most likely be too salty. Also, the cook time will vary somewhat depending on how done you like your eggs. At 15 minutes of cooking and 5 minutes of resting, my eggs were still at least “medium”. 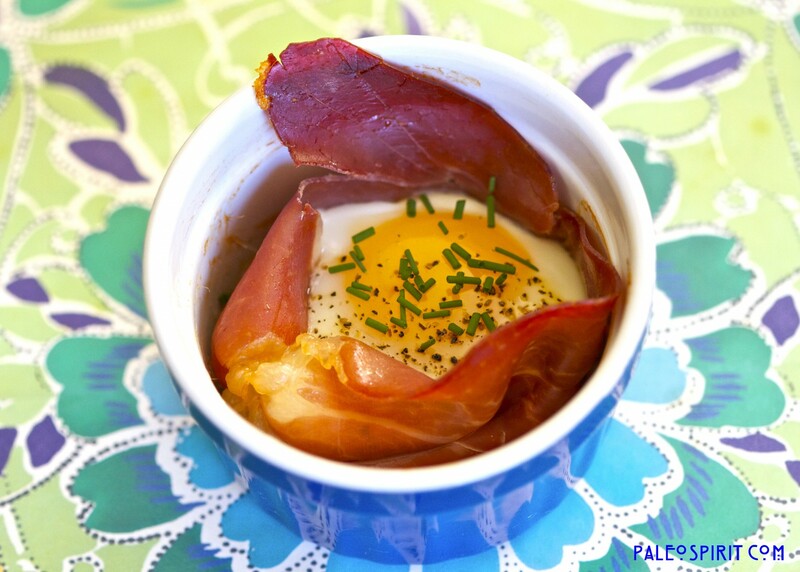 4 Responses to "Baked Eggs in Prosciutto Cups"
This looks so delicious. Can’t wait to try it! All of these look wonderful! I am new to paleo, but have experienced great results so far and am interested in any help anyone would send my way! Can’t wait to try Paleo..my son an Exercise Physiologist is a devotee and it all makes sense when explained well.